But when you come from a family with a storied past in the sport of running, the bar is set high. What makes the Matons unique is their lineage. Dad, Jim, was the 1988 NCAA champion in the indoor 800 meters at Eastern Illinois University. Mom, Michelle, was born and raised in South Africa and hails from a family of runners. It even extends deeper--Michelle's father, Deon Dekkers, was the South African cross country champion in 1969 and owns a personal best of 4:00 in the mile. Michelle, known for her barefoot style of running, went on to become an All-American at Indiana University and won the 1988 NCAA individual cross country championship. The success didn't stop with Michelle and Jim and continued on with their children, first in Ashley and Matthew, both whom featured as prep standouts at Bend High School and later on at the University of Oregon in the mid 2010s. 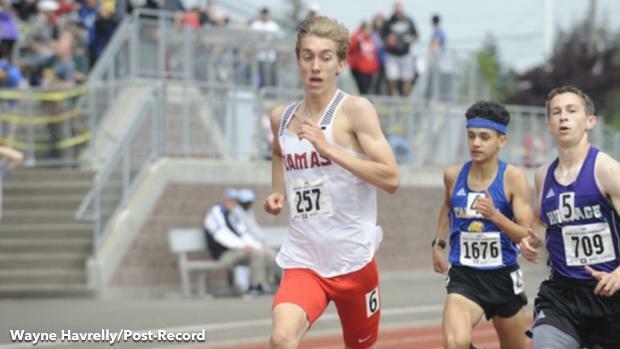 Next in line is now Daniel, an 18-year-old senior at Camas High School in southwest Washington and the two-time Class 4A champion at 800 and 1600 meters. He's fresh off a summer that saw him run 1:50.79 in the 800m at the USA Junior Outdoor Championships in June and is one of the leading candidates in the nation among high school boys to break four minutes in the mile this year--just like his older brother Matthew did in 2015. "Those conditions [in June] were okay," Maton said of USA Junior Outdoors. "The race got delayed due to thunder, I was sick that day. It was definitely a huge confidence booster." And Maton's final track season at the high school level--he's a University of Washington signee--is now here. He is currently ranked No. 46 on the MileSplit50 for the 2019 Boys Indoor season. At the University of Washington Indoor Preview Invitational on Jan. 12, he competed in the first heat of the 800m run against former two-time NCAA indoor mile champion, and now Brooks Beast Track Club athlete, Josh Kerr, among a field of collegiate opponents. Maton ran 1:51.87, finishing in fifth place. The time is No. 1 for high school boys so far in the indoor season. "That was a good meet, it was fun," Maton said. "I wasn't expecting to go so fast so early on, so it was nice. Sub-1:54 was the goal. I was a little surprised but I knew I could run fast. The [winter] workouts were so cold and rainy, so my times weren't that fast yet and I hadn't really touched speed work yet." Maton said running in a field where winning wasn't the expectation allowed him to just focus on the race itself. The race comes after Maton spent two weeks training during the winter in Cape Town, South Africa, where he competed in the 2018 Bestmed Eden Street Mile Series. In impressive fashion, Maton recorded a 4:19 mile on Monday, Dec. 17, a 4:12 mile on Wednesday, Dec. 19, and a 4:13 mile on Friday, Dec, 21, in the first week in Cape Town--a span of five days. Maton is right on track so far for his 2019 goals as he hoped to open up the season near his fastest times. He's already done that in the 800 meters, and his winter training indicates he's close in the 1600 meters as well, where he owns a personal best of 4:07.50. Despite the fact that Maton's only run three indoor races over his career and with a future at Dempsey Facility, he told MileSplit USA that he is not currently thinking about competing at the New Balance National Indoors in early March. Instead, Maton said he wants to stay regional for indoor races. Make no doubt about it--a sub-four minute mile is the paramount objective this track season for Maton. Races like the Nike Jesuit Twilight Relays in Oregon, Brooks PR in Seattle and the USA Junior Outdoor Championships in Indiana are circled on Maton's running schedule. If he dips below four minutes this season, he'll be the 11th high school boy to accomplish the feat. As for the 800m, Maton wants to first run a personal best before focusing on breaking the 1:50 barrier. His next indoor race is the UW Invitational on Jan. 25 and Jan. 26.